Geotechnical - NCD Separation Solutions Ltd.
As the name suggests, geotechnical centrifuges are used to test models of geotechnical problems such as the strength, stiffness and capacity of foundations for bridges and buildings, settlement of embankments, stability of slopes, earth retaining structures, tunnel stability and seawalls. Other applications include explosive cratering, contaminant migration in ground water, frost heave and sea ice. The centrifuge is useful for scale modelling of large-scale nonlinear problems for which gravity is a primary driving force. Geotechnical materials such as soil and rock have non-linear mechanical properties that depend on the effective confining stress and stress history. 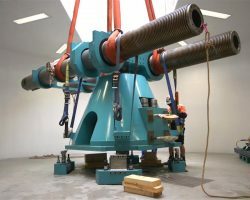 The centrifuge applies an increased “gravitational” acceleration to physical models in order to produce identical self-weight stresses in models and prototypes. The one to one scaling of stress enhances the similarity of geotechnical models and makes it possible to obtain accurate data to help solve complex problems such as earthquake induced liquefaction, soil-structure interaction and underground transport of pollutants such as dense non-aqueous phase liquids. 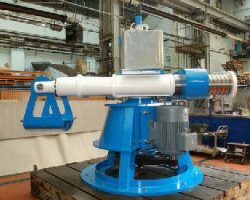 Centrifuge model testing provides data to improve understanding of basic mechanisms of deformation and failure and provides benchmarks useful for verification of numerical models. Large Earthquakes are infrequent and unrepeatable but they can be devastating. All of these factors make it difficult to obtain the required data to study their effects by post-earthquake field investigations. 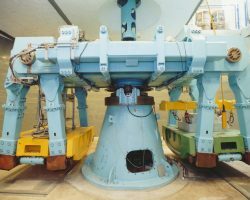 Centrifuge modeling is therefore a valuable tool for studying the effects of seismic activity on critical structures without risking the safety of the public. The efficacy of alternative designs or seismic retrofitting techniques can be compared in a repeatable scientific series of centrifugal tests.